Steel-cut oats can take 20-30 minutes to cook, so I usually save them for the weekend or for a lazy morning when I have a lot of time. Last night, though, I stumbled upon The Kitchn’s method for making creamy steel-cut oats overnight. Starting the oats the night before make them virtually instant the next morning! Just heat, eat, and run off to wherever you have to go. I made enough for two servings, but you could certainly make a batch that will serve four. 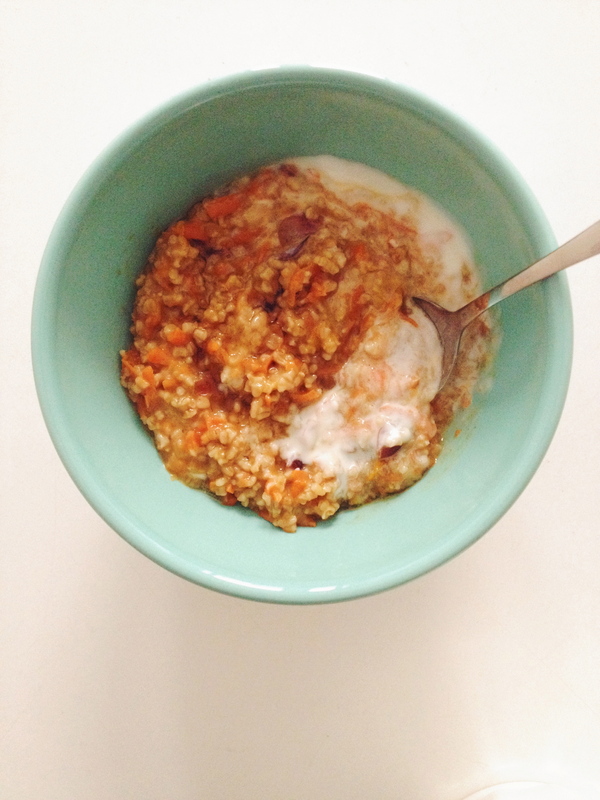 Steel-cut oats reheat well as leftovers. 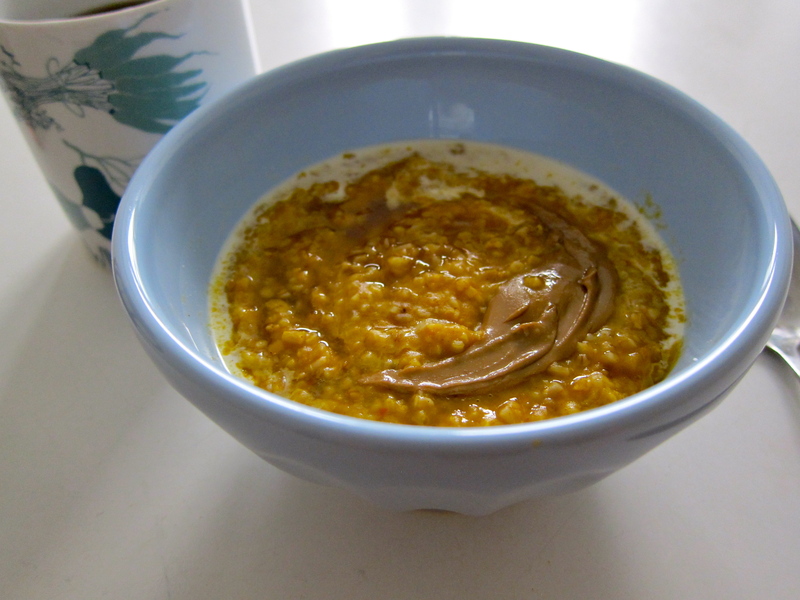 I ran out of milk, so I added a hefty scoop of pumpkin puree and accompanying spices upon simmering my oats after their overnight stay. 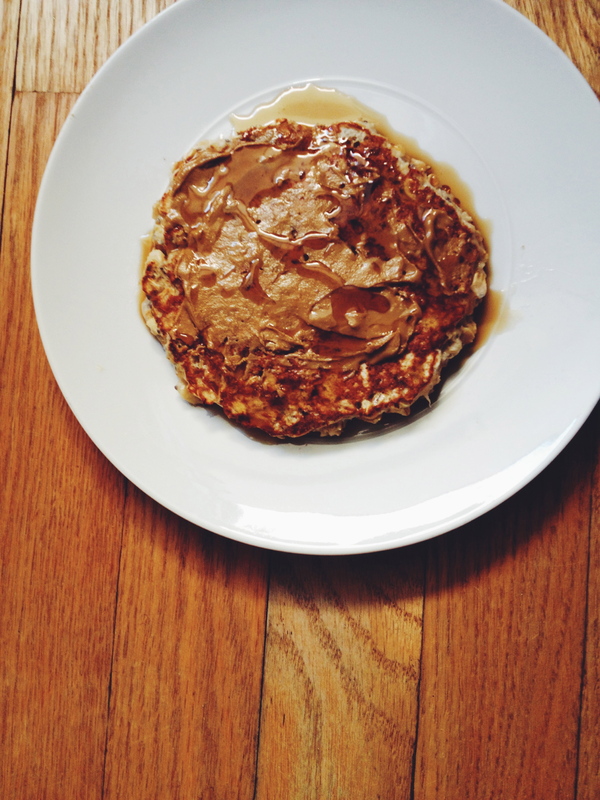 For serving, a drizzle of maple syrup, a small splash of cream, and a swoosh of sunflower seed butter. A perfect breakfast with black coffee on yet another COLD day in New York City. 1. Start this the night before. You want to have steel-cut oatmeal. Measure out your oats. This quantity will make about 2 servings. 2. Heat about 1/2 teaspoon butter or olive oil in a 2-quart saucepan set over medium heat. Add the oats and fry them for about 3 minutes, or until they start smelling toasty. 3. Pour in the water and add the salt. Stir. 4. Bring to a rolling boil. 5. Turn off the heat and cover the pan. Leave it on the stove, and go to bed! 6. The next morning, uncover the pan and bring the oatmeal back up to a simmer. 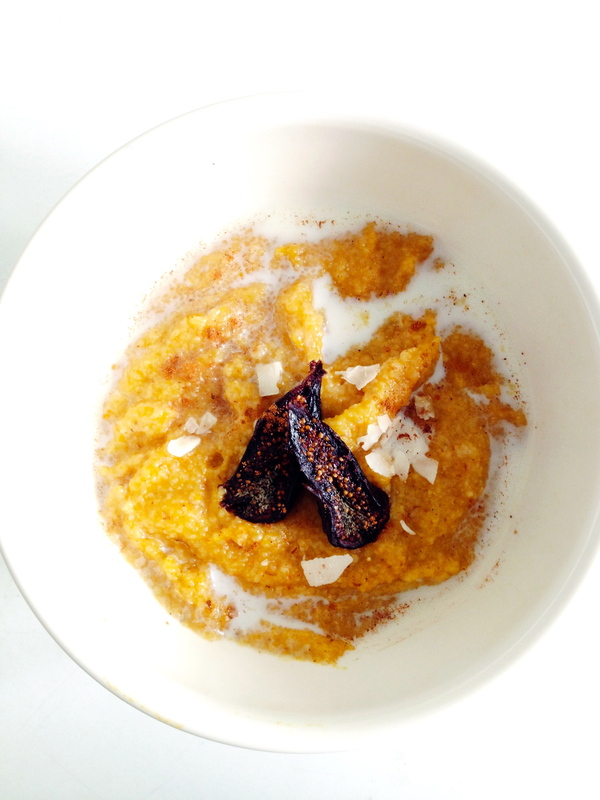 If you would like creamier oatmeal, stir in the pumpkin puree and spices before reheating. Add a splash of vanilla. 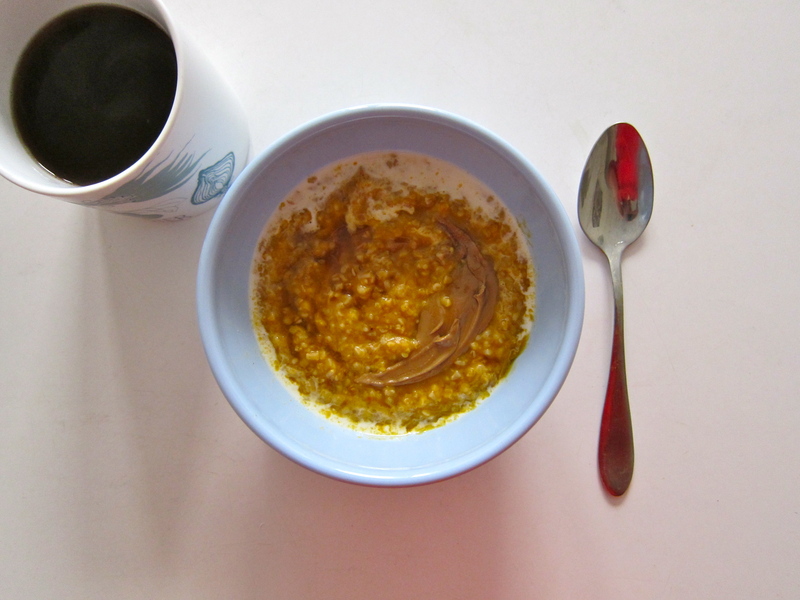 When the oatmeal is warm, scoop out and enjoy with maple syrup, a splash of cream, and sunbutter! • Re-heat leftovers in just the same way: warm up on the stove, or in a bowl in the microwave. 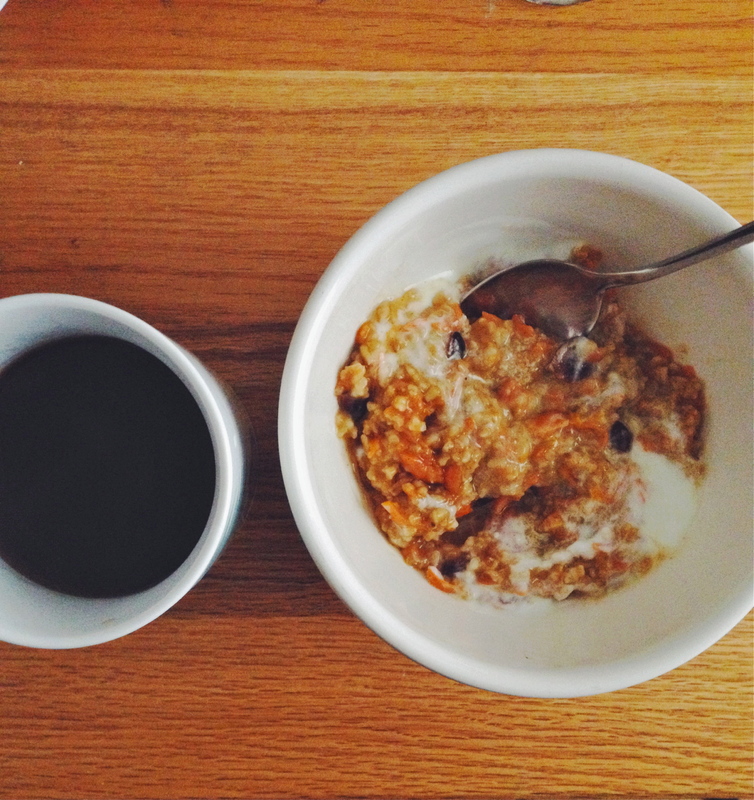 Over the last year, I have really grown an appreciation for a morning bowl of oats. Maybe because New York City (vs. my old stomping grounds in California) has real seasons, so I crave something hot in the morning during the inescapable winter chill. Even during the beating heat of summer, I ate cold “overnight oats” or “muesli” for breakfast. Rolled and steel-cut oats my go-to choices, but I have also enjoy a porridge made from farina, millet, amaranth, or barley. When I have an early morning shift at the bakery, I sometimes take along a packet of instant oats for breakfast, but I only buy the original or plain versions where the ingredient list only says “rolled oats” and not much more. No need for those extra fake ingredients when I can simply add my own sweeteners and toppings to plain instant oats. I used to heat rolled oats in the microwave, which is totally acceptable and tasty, but when I can take the extra few minutes, I now prefer to cook my oats on the stove. I use a mix of milk and water to cook the oats because I like how creamy they get from the milk. I saw that Cookie and Kate posted these Morning Glory Oats the other day, using coconut milk for some of the cooking liquid. I recently made Split Pea Soup that used only 1/2 cup of coconut milk, and I have been trying to find ways to use up the leftover milk. Perfect. I modified her recipe, which is a modification of the original recipe from Megan Gordon’s new cookbook, Whole Grain Mornings. 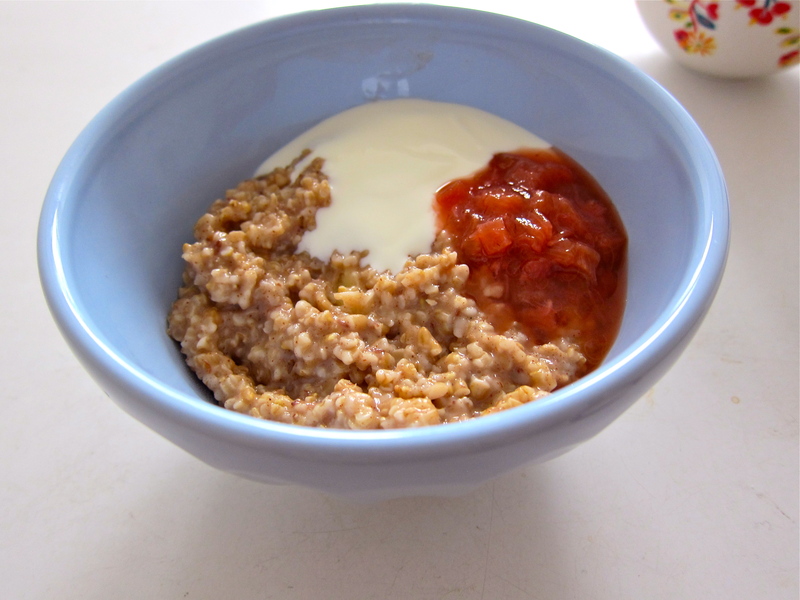 This recipe uses steel-cut oats, but you could also make this with rolled oats, quick oats, or another breakfast grain. 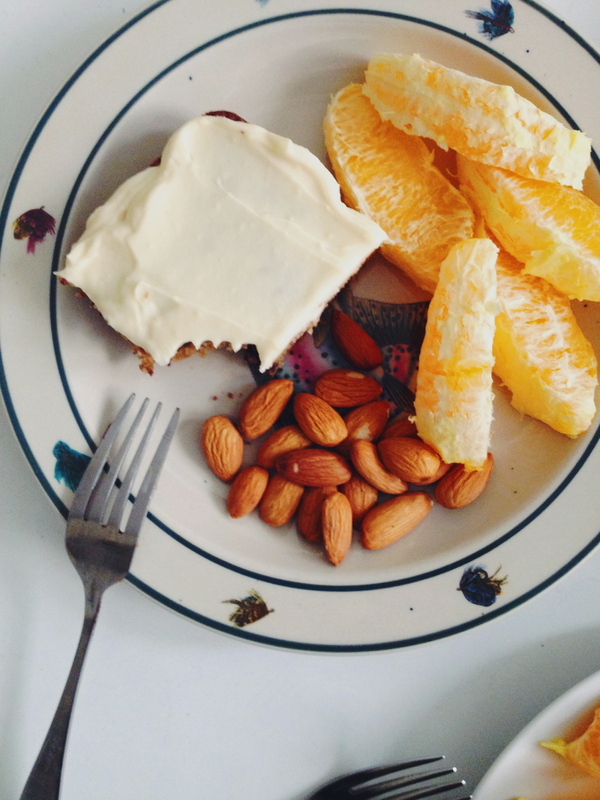 Shredded carrot strands and wintry spices make this hot, creamy breakfast feel like dessert. 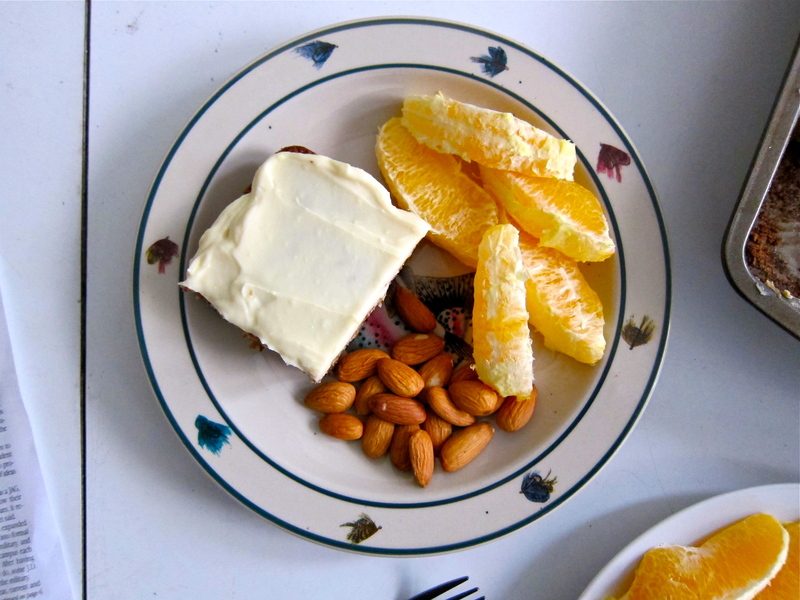 Orange zest adds zing, and a swirl of yogurt at the end cools the oats and adds to the healthy decadence (omit the yogurt and use nuts or nut butter if you want this recipe to remain vegan). In a saucepan, bring the water and milk to a boil. Stir in the oats, carrots, dried fruit, cinnamon, ginger, nutmeg and salt. Bring the mixture back to boil, then decrease the heat to low and partially cover the pot. Cook the porridge, stirring only occasionally, until it begins to thicken and the oats are soft yet chewy. Check for doneness after 25 minutes* of cooking (it might need a few more minutes of cooking). Remove from heat and stir in the orange zest and vanilla. Add maple syrup (or other sweetener), to taste. Cover and let the oatmeal rest for 5 minutes before serving. Serve the oatmeal with a swirl of plain yogurt. *Rolled or quick oats will cook much faster than steel-cut, anywhere from 1 to 5 minutes. I made a mini batch of (black pepper) ice cream last week that required three egg yolks. But what was I to do with the leftover whites? 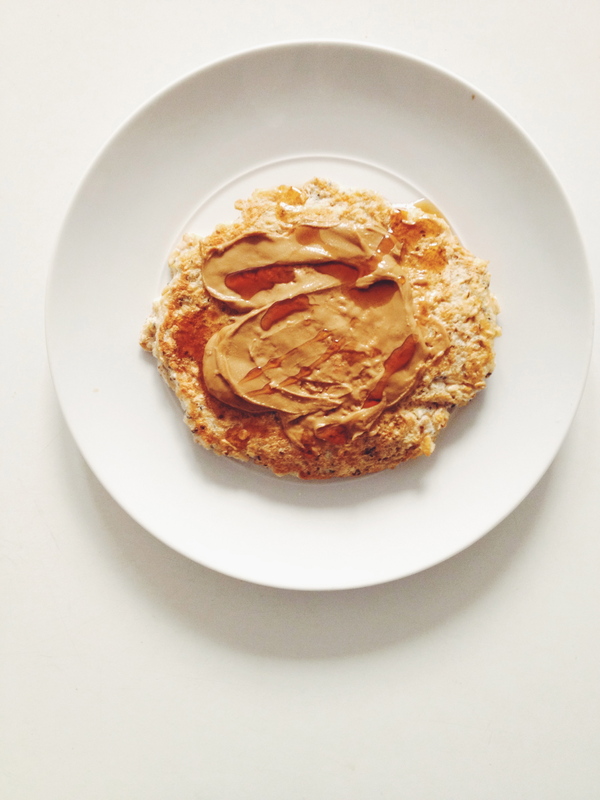 Pondering my options, I remembered my friend Amy making this peculiar “protein pancake” for herself in college. I finally decided to investigate. This is not your typical pancake. There’s no flour; just oats, egg whites, baking powder, and spices. Add some mashed banana (or any other kind of fruit) to the “batter” for a little more body. I made this twice for breakfast last week. The first time (see the picture below), I did not put any fruit in the batter and cooked it in a tiny dash of coconut oil. My first attempt came out a bit pale and dry, but after lubing it up with a hefty amount of maple syrup and sunflower seed butter, I was very happy. …came out just right. I added half of a banana, mashed, to the batter and sautéed it in butter (I used just shy of 1/8 of a teaspoon, so not that much at all). The edges were golden, and the fruit gave the pancake a little more oomph. 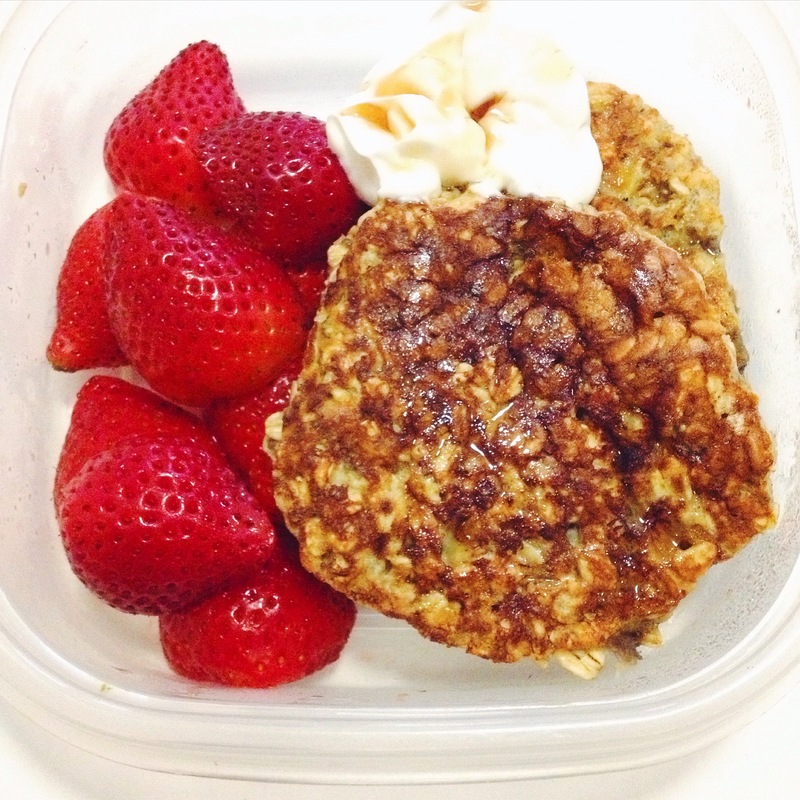 This oatmeal “pancake” is full of protein, whole grains, fruit, fiber, and healthy fat. 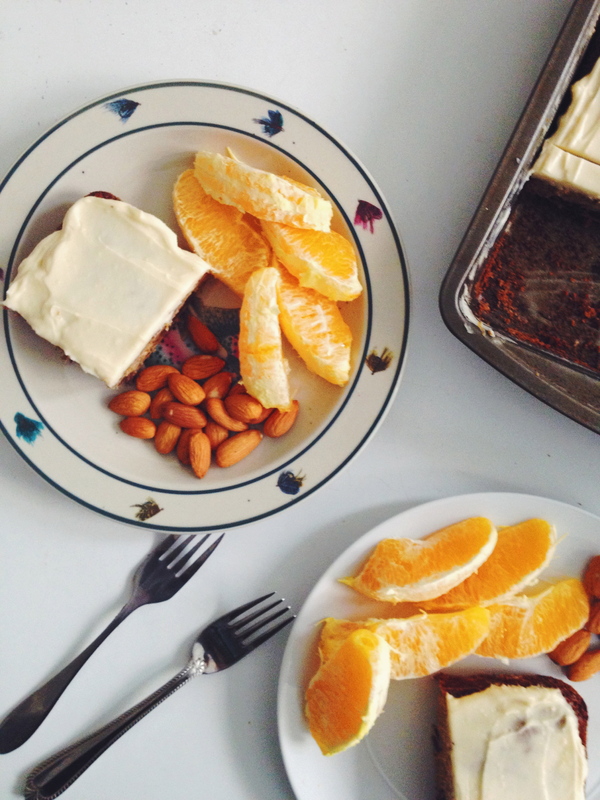 A great way to use up leftover egg whites, but really just a great way to kick off the day. Prepare the batter the night before to save time and soften your rolled oats. Or, prepare the batter first thing in the morning, set the water to boil for coffee and get yourself dressed. When you come back, the batter will be ready to cook. Note that you can change the ratio of ingredients. 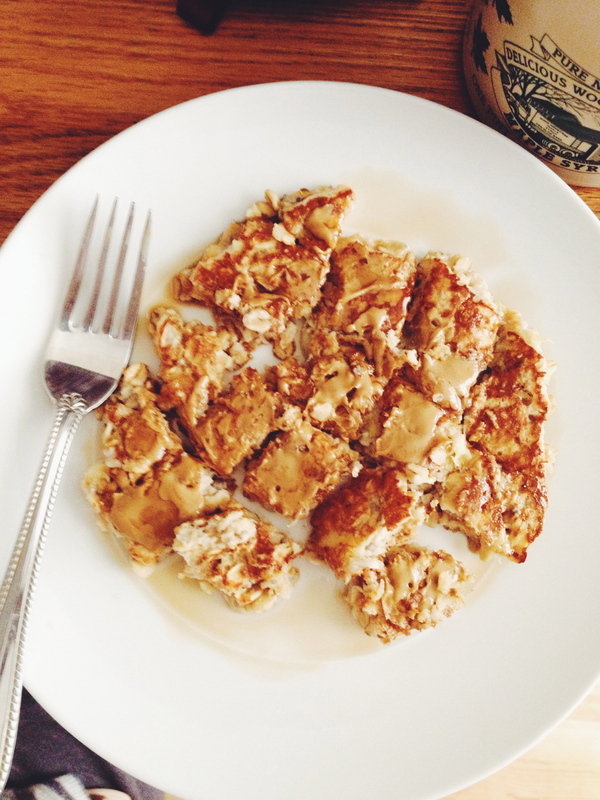 If you want a smaller portion, use 1/4 cup oats and 1/4 cup egg whites. 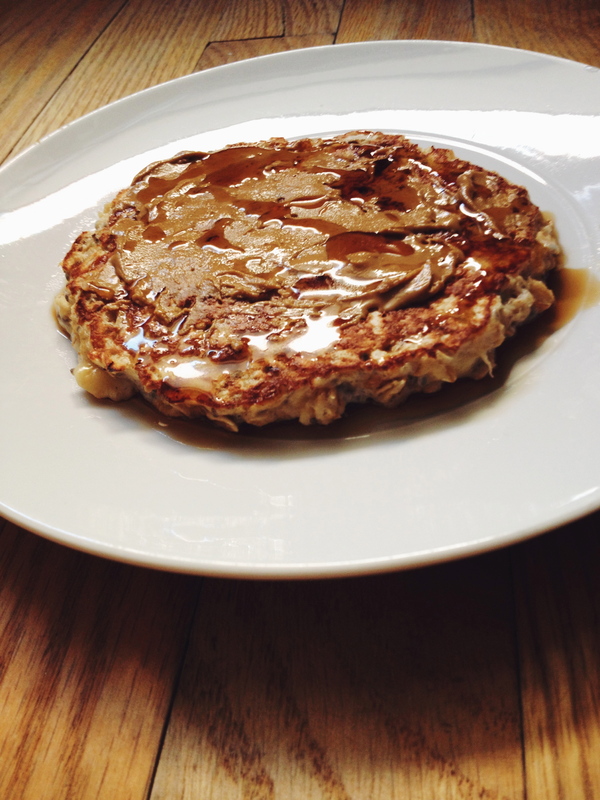 Or you can go bigger and use 1/2 cup oats and 1/2 cup egg whites. After making the pancake once or twice, you will easily get a feel for portions and you can be looser with the measurements. Mix together all ingredients in a bowl. Let sit for 5 minutes or so. 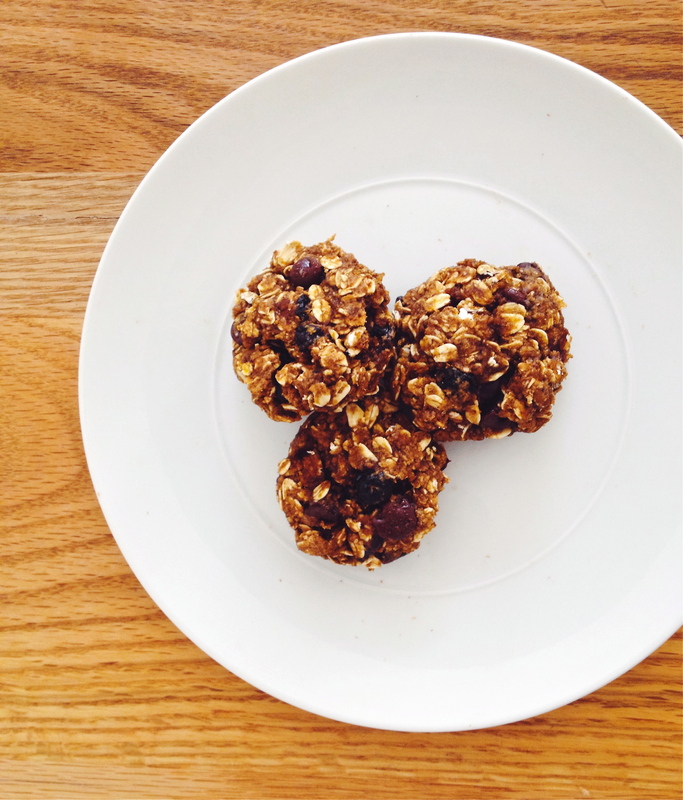 **If using rolled oats, you can mix together the night before so the oats soften. Spread a touch of butter or oil onto a heated skillet, and pour the batter in while shaping it into a large disc “pancake.” When you can shake it around in the pan, it’s time to flip. ++You can also do two mini pancakes instead of one large one. Cook until golden, about 2-3 minutes per side. Once cooked through, top with syrup, nut/seed butter, jam, yogurt, or fruit…endless possibilities. Oatmeal Protein Pancake, prepared the night before. In the morning, just pop the pancakes in the microwave for 30 seconds or so, place them back into the to-go container, add toppings and fruit, and run out the door! Yum. These oatmeal cookies are magical because the only “glue” holding them together is 1 egg and 1/2 cup pumpkin puree. No butter, no oil. Just pure pumpkin goodness. 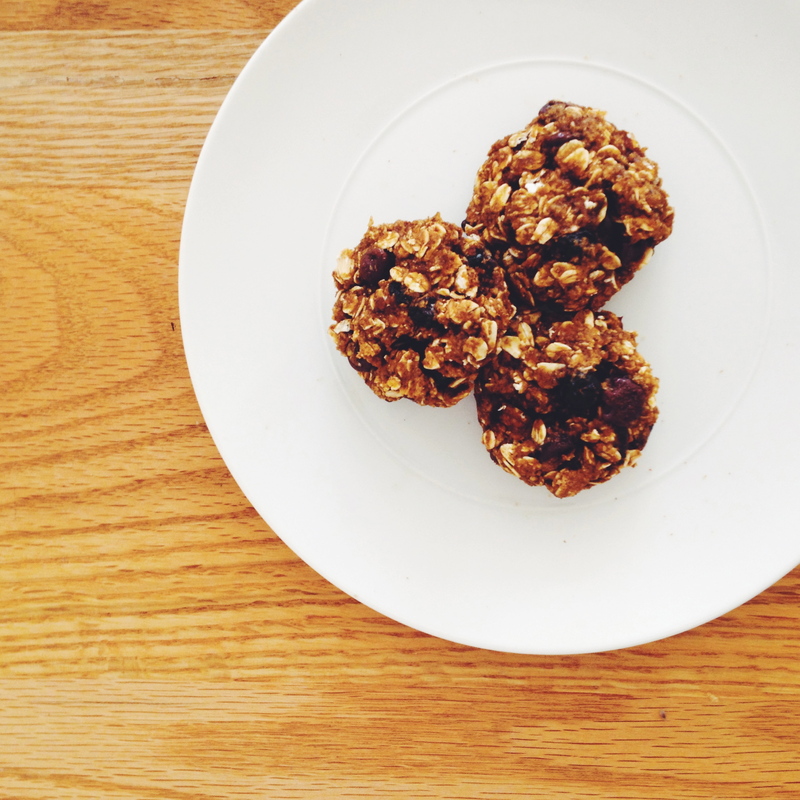 Reminiscent of a trail mix cookie, every bite is full of something oaty, fruity, doughy, and chocolatey. Who else is with me in that they love the softness of a chocolate chip once it has been baked into something?! So tempting to pick out all of the chips from the cookies! Don’t like pumpkin? Try using mashed bananas instead! In a mixing bowl whisk together pumpkin, egg, and vanilla until well combined. In a separate bowl, combine flour, oats, sugars, baking powder, baking soda, salt, spices, chocolate chips, and dried fruit. Fold together the wet and dry ingredients until just combined (I like to use my hands at the end!). The dough will be very thick. Drop by spoonfuls onto cookie sheets and slightly flatten to the shape you want your cookie. Bake for 12-14 minutes until lightly browned. Allow to cool on the cookie sheet for at least 3 minutes and transfer to a wire rack. Cookies stay fresh at room temperature for 3 days in an airtight container. I forget sometimes that pumpkin is a vegetable. It has such a creamy taste to it, and so often gets sweetened and used like a dessert. But low and behold, half a cup of plain pumpkin puree is low in calories (about 45 calories) and fat, and contains a hefty amount of vitamin A and potassium. 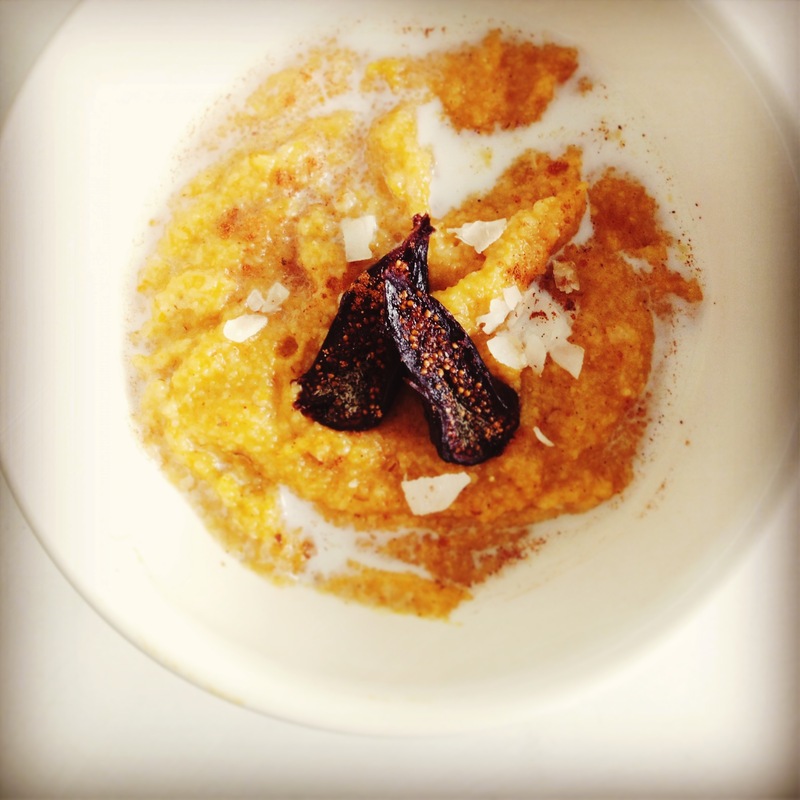 So let’s get on the vegetable-for-breakfast bandwagon and cook up some Pumpkin Farina! Are you familiar with Farina? Some people call it Malt-O-Meal because that is one of the name brands, but it is basically the same thing as Cream of Wheat. You could definitely swap regular oats or steel cut oats (or millet, or quinoa, or couscous, or amaranth, or bulgar…) if you prefer those, I just chose to use Farina this morning. The exciting thing about Farina is that, like regular old-fashioned oats, it only takes about 5 minutes to cook! 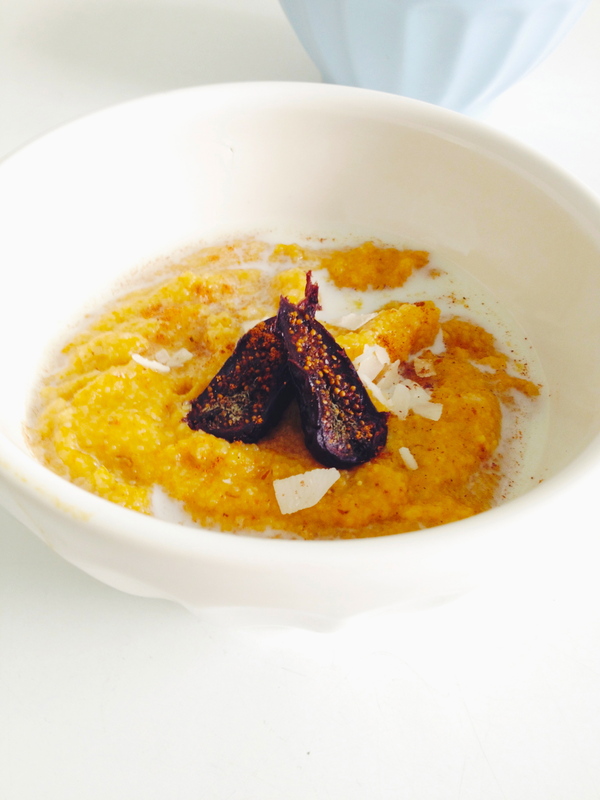 Plain pumpkin puree gets swirled into the nearly cooked cereal grain. 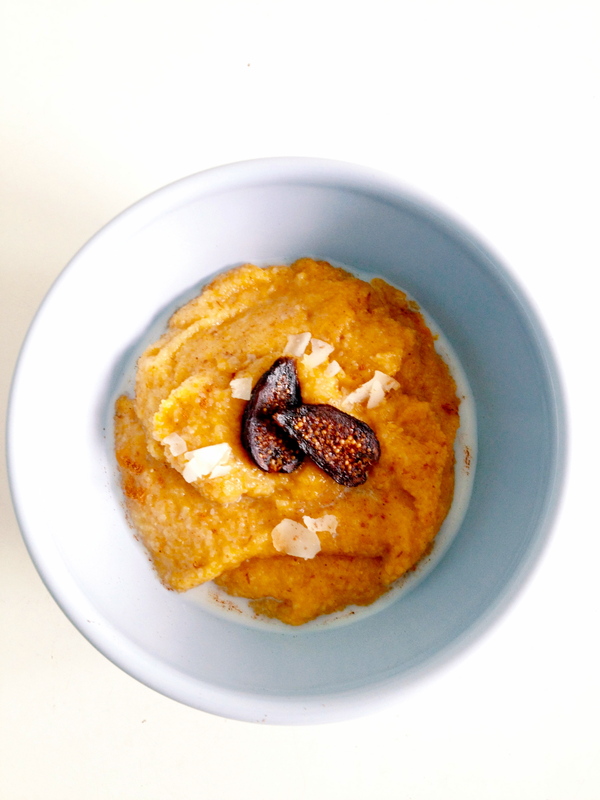 Without any seasoning, plain pumpkin puree tastes a little too…plain. To bring out the fall flavors, throw in some spices–I used cinnamon, but feel free to add nutmeg, ginger, cloves…–and a nice dash of maple syrup and vanilla extract. I also stirred in a little spoon of ground flaxseed to boost the healthy fats. If you use a non-dairy milk, boom, vegan breakfast. Toppings can be endless. 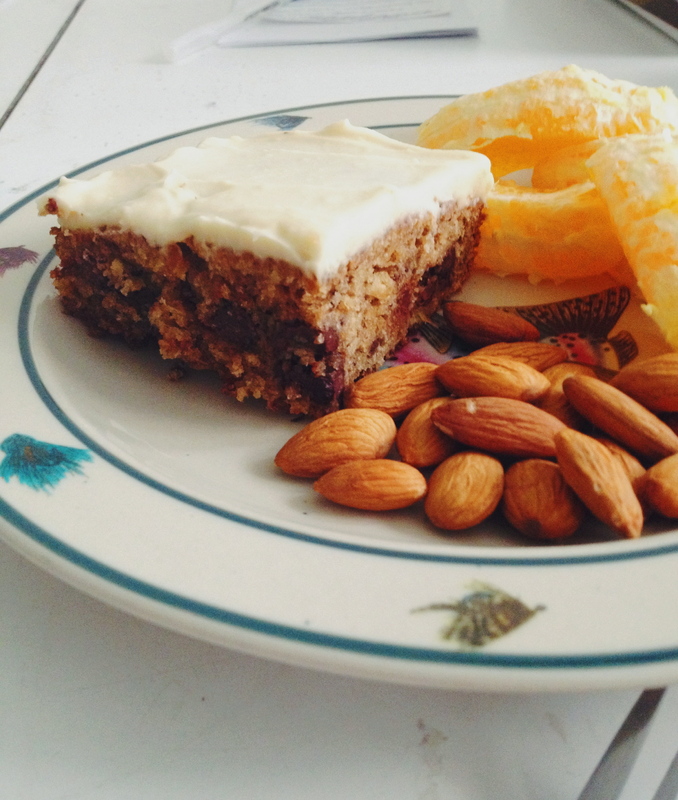 This morning I used a dried fig sliced in half and a little sprinkle of coconut chips. Warm milk, soft cereal grains, and smooth pumpkin make for a breakfast that tastes like dessert, but packs in a lot more nutrition. Sayonara summer. Fall is coming. 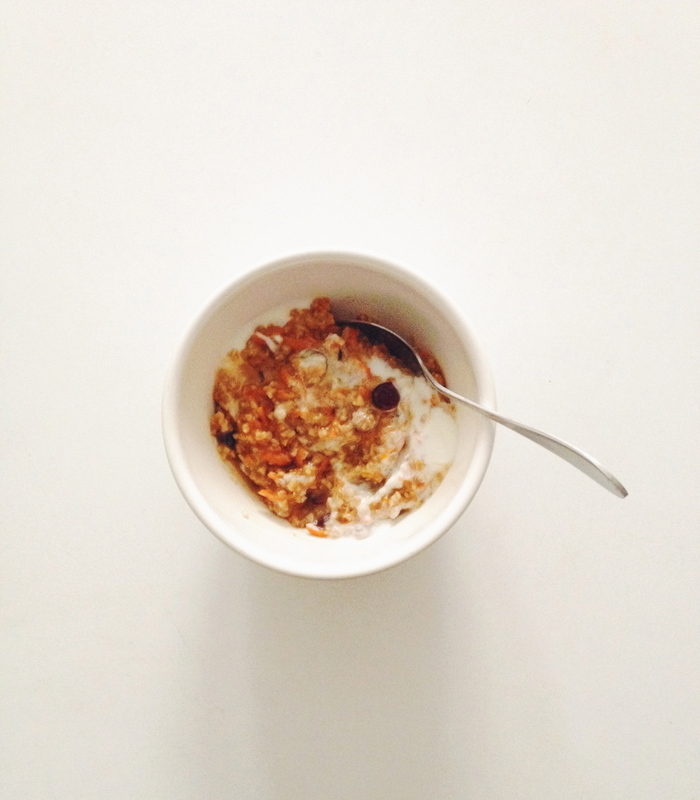 **NOTE: If you use a different cereal grain, check to make sure you use the correct ratio of grain to liquid. 1. Bring water and milk (2 cups total) to a boil. Add salt and farina. Constantly stir gently. Bring to a boil, then reduce heat to medium-low. 2. Continue stirring until the cereal thickens. At this point you can stir in the cinnamon, flaxseed, vanilla, and maple syrup. If you desire a thinner cereal, add in additional milk. 3. When cereal has cooked into a thick consistency (like thick applesauce) turn the heat to low. 4. Stir in the pumpkin over low heat. 5. Turn off heat and spoon cereal into bowls. Add a dash of cinnamon and a splash of milk on top. Top with dried or fresh fruit and a sprinkle of coconut chips. It’s strawberry rhubarb season! I’ve been eating my homemade Strawberry Rhubarb Compote with a cozy bowl of oatmeal, swirled into a creamy avocado-based smoothie, and spread on toast with some nut butter. A fruity sweet treat that is the epitome of spring. 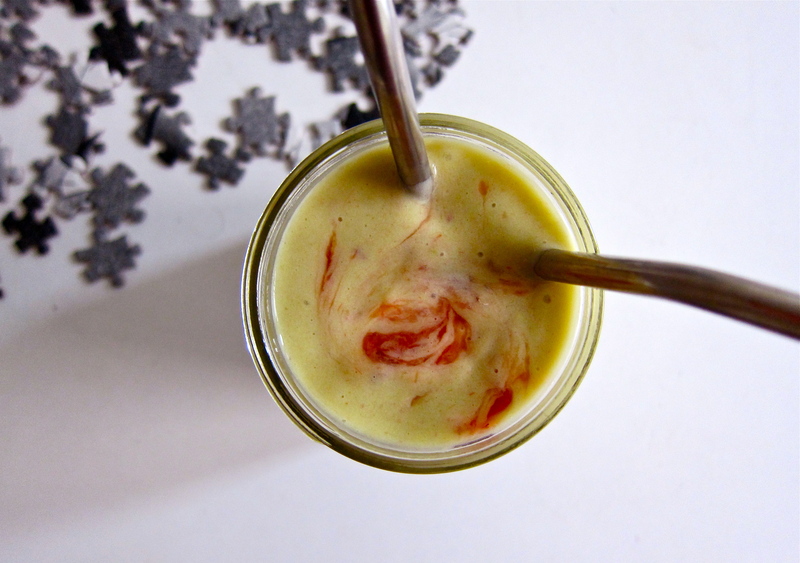 To learn more about rhubarb’s health benefits and to get the recipe for my Strawberry Rhubarb Compote, head over to the blog Lean Green Healthy Machine. Lean Green Healthy Machine has some great tips for healthy eating, fitness, and living green. Alexandra is the chief nutrition editor for the website, and she is also a fellow nutrition grad student with me.